"The Road To Mt. Shasta"
Driving around the back of Mt. Shasta on Forest Road 20 I saw this dirt road heading to The Mountain, so I made a detour and followed it for a while. I like seeing this glimpse through the big trees. I really like the definition of green trees as the dark ones with strong blue accents almost create a frame for the Mount Shasta. The next green trees have strong oranges that move down the red scale for accents as we move forward th the front where we have violets and blues. All of these colors are present in a muted form in the dirt road. "x 10" matted print on photo pape. 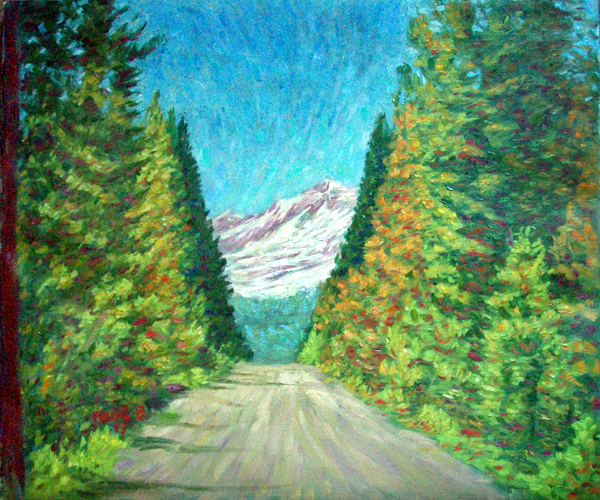 Pointillistic/Impressionist Giclee prints of Mt. Shasta on real canvas or heavy watercolor paper are available. One of a kind Mt. Shasta embellished prints, which are Giclee prints retouched in genuine oil paint by PaulB. Unless noted PaulB's original Pointillistic/Impressionist oil paintiings are oil on canvas. Paul Berenson's pointillistic/Impressionist oil paintings are in privale collections around the world, including the downtown Los Angeles Athletic Club and have appeared in numerous publications, including the New York Philharmonic Playbill. PaulB.com also builds websites and PaulB is a member of the LA Web Professionals Group.